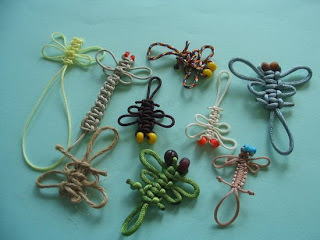 In these dark and dreary days of market crashes, lost savings and wrecked lives, I find relief in making these little knotted dragonflys with beady eyes. These elusive bugs sure provide an antidote from the toxic problems of the current age and times. Some old sage might have said of them "Blessed be these simple critters with their diaphanous wings, they will give us peace.. ....." oops, sorry, dreamt that one up and just joking, read too much Murakami and Kundera ... heh! heh! The knot used is the flat knot, sometimes called square knot.The beads used in the eyes are old Chinese and Indonesian glass seedbeads as well as a couple of Venetian whitehearts. On a more mundane level these dragonflys also make good decorative material for handbags, backpacks, mobile phones and can be used as souvenirs and giftaways. 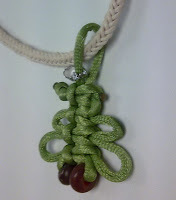 Or it can be worn on a cord as a pendant. As these dflys can be made in small sizes I need only use the leftovers and remnant cords from other projects and need not incur extra expense. So they are really fun and free. 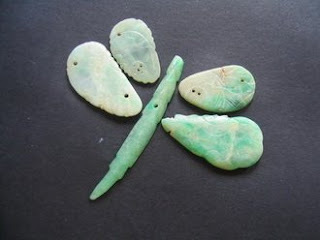 Here's a dfly of another kind, from my jade collection. And not forgetting the real thing from my garden fence. I stalked it the whole morning and finally caught its diaphanous wings ! Oh, here's a bonus ! 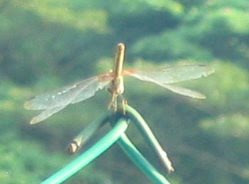 I spotted another welcome visitor on my fence, -- a red dragonfly. 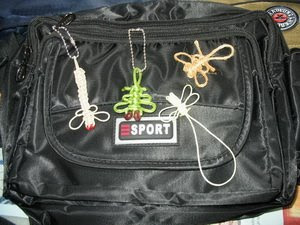 Finally thanks to Jack Keene http://whatknot.tripod.com/knots/dragon.htm for the online pattern and tutorial on the making of the dragonfly using chinese flat knots.